Is The Jeep Wrangler The Best Off-Road Vehicle? What's your take and opinion on what we have to say here? Do you engage in #OffRoading? The term ‘best’ in any question about cars is a difficult one to determine, especially when you consider that we all have different tastes. When it comes to off-road driving, however, the question of which car is best can pretty much come down to how well it handles different terrains. 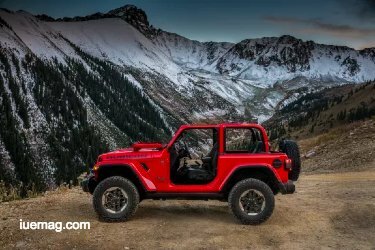 With that in mind, one of the hot topics in the world of off-road driving today is whether or not the Jeep Wrangler is actually the best or not. With SUVs and 4x4s being released faster than most brands can keep up with, have Jeep taken the cake as far as off-road driving goes? We’re exploring the wrangler and a few of its biggest and best competitors below. The Jeep Wrangler is undoubtedly one of the most iconic off-road vehicles the industry has to date. With a brand new model currently on offer too, potential buyers get to experience all of Jeep’s tough terrain expertise with just the right dose of modern comfort. With removable doors and fold-down windscreen, this model is the epitome of rough-terrain driving, so is it really so difficult to believe that this is the car of choice for most looking for an off-road adventure? However, it does come with limitations. Some claim that there’s limited storage, especially on the 2-door model, while others complain about how noisy the car is. With other complaints about slow acceleration, is there a better alternative? If you’re looking for something a little more compact, the Jeep Cherokee is a great crossover alternative, especially if you pick up the Trailhawk model. This car can handle some incredibly difficult terrain almost as well as its Wrangler counterpart and comes with the tech to prove it. With Selec-Terrain technology, drivers can choose driving modes from Auto, Snow, Sand, Rock, Mud and more to make the entire experience that much easier. However, the Cherokee’s downfall has been a hot topic and the culprit? It’s strange looking nose. For those that really can’t bear to buy a car with such a look, the 2019 model is already looking to be a lot easier on the eye. The Land Rover Range Rover is a close second on most of ‘4x4’ lists and has been dominating the markets since 1970 when it was first introduced into the UK. While it doesn’t have quite the same off-road look at the Jeep, it’s certainly not far off and some of the older models hold that true rough look with just the right dash of modern aesthetic. Of course, we can’t talk about the Range Rover without mentioning it’s turbodiesel engine options, which give the car completely solid low-end torque to help propel it over all kinds of different terrains. Despite the Jeep Wrangler and the Land Rover Range Rover offering familiarity as far as design goes, the Mercedes Benz G-Class has been offering military drivers the ideal off-road experience for decades. After being introduced back in 1979, this model was hailed to be an answer to the Range Rover, but since then, it’s taken on its very own rough and rugged look that attracts off-roaders from all over the world. However, due to the fact that its hand built in Austria and it’s increasingly modern tech and design, it’s getting more and more expensive which isn’t necessarily what you want from a vehicle that you’re planning on driving across dangerous terrains. If you want a smooth off-road drive that scares off everyone you come across in the meantime all in the same push of a pedal, then the Ford F-150 Raptor is the choice for you. This car comes with the ability to travel at high speeds over all kinds of terrain and if that wasn’t enough to terrify you, it’s big, bulky and beast-like appearance certainly would. It has 450 horsepower and 510 pound-feet of torque all from its twin-turbocharged EcoBoost V6 engine which, of course, gives it the power to tackle pretty much anything. There are plenty of good off-road cars on the market today, from the fierce Ford F-150 Raptor to the crowd favourite Land Rover Range Rover. Whether any of these alternatives beat out the Wrangler as the best off-road model is, as per usual, a matter of preference, but one thing’s for sure: There are some models out there certainly giving it a run for its money.